A lot of you have thousands of contacts in Glasnost. By default everyone sees new ones as they are added to the system so it is not hard to keep track of who your business is connecting with. What is harder is to easily see a complete list of your own contacts. Until now. We have added a new 'Search by Tag' feature to the top of the Latest Contacts panel. From this you simply start to enter the name of a tag and the list below will progressively filter your records to just show contacts that match. You can do this for any tag, so if, when adding a new contact, you tag that person with the name of whoever is your companies primary point of contact for them, they can then easily keep tabs on everyone they are responsible for. A major new feature has been added to Pipeline; Statusline. This allows you to visually see the Status of all your prospects and easily update the status of each one by drag and dropping them around. You also see the cumulative value of prospects at each stage. This makes it much easier to understand the structure of your Pipeline. You can see all Prospects or filter by Prospect Owner. If you have any issues or would like to discuss just get in touch. Another small change. If you 'Search comments' in Contacts and then click on one of the results the pop up now shows the related company and contact AND provides a direct link through to further details. Just a small change that you hopefully will find useful. When you Search Tasks in Contacts the option to date has been to select From and To dates based on the date tasks were added. We have changed this to search Date due instead. This makes it easier to see tasks that one or more people have outstanding. A better choice we think. Up to now to edit the 'Last Contacted' data in the Contacts module you had to go into a contacts details, then click on edit, then select a date, and then close the edit pop up. So we've made this x10 easier. When you are on a contacts details page you will now see a button to the left of 'Send vCard' - simply click this and the 'Last Contacted' field will be updated to today's date. One click instead of four. Hopefully you will now find it much easier to keep track of when you last contacted someone. Up till now you have been able to perform a search against your Pipeline Prospects by a particular related contact, but not by related company. As of today you can search for all prospects that relate to a specific company. We have added a predictive search to the 'Relevant Company' field when you add a new prospect. Once you have entered two characters all matches from the companies you have added to the Contacts module will be returned for you to select from. This should make the data entry quicker and also more structured - which will help when you need to search for all prospects that relate to a particular company. After performing a search and displaying data in list format the value is now outputted in a more readable format - with appropriate commas and no trailing digits. Also when you download to spreadsheet the column headers now have spaces between words. A couple of small things, but worthwhile improving. We were asked if we could add the ability, from within Contacts, to see any Pipeline Prospects that a company or contact are or have been involved with. Now you can. On the company homepage you will see all prospects that are linked to anyone in the company. 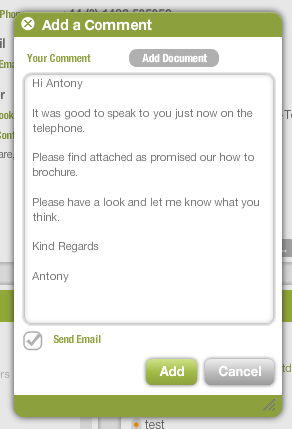 On the contact homepage just the ones relevant to that individual. Available only to people with Pipeline access you can get to the information by clicking on the link in the right hand panel. As below. We've found that our users are increasingly choosing to run projects with multiple external partners. To ensure they can do this but not risk any leakage of information between parties unless intentional we have added the following functional changes. With these in place we are confident you can work with as many external parties as you wish, secure in the knowledge they'll only see what you want them to see. They can add a comment or task but can only distribute this to Internal users. If another external user is linked to the project they cannot be contacted by an external user. Can only see documents that have either been uploaded to all or specifically linked to them. Can only move documents to another project they are linked to if they uploaded that document. Can only distribute a document they are uploading to internal users. An external user cannot distribute to another external user. Internal Admin and System Admins can distribute Comments, Tasks and Documents to anyone. A document can only have its distribution list edited by the person who uploads that document (apart from system admins). Effectively external users have been put in a silo. So you could work with multiple external users on the same project but each of them would know nothing about the other; unless through the wishes of an internal admin user. Someone set up as an internal user can fully participate in a project but can only distribute documents to other internal users. So they cannot unwittingly distribute a document to an external party who should not see it. Internal admin users now have complete control over who sees what. Please let us now how you get on with these changes. When you set up a Project to be shared via a browser with third parties you now have the option to restrict access by email address. This is an alternate to simply adding a password, or leaving open to all. Now when users click on the link you send them they will have to enter their email address. On submission the system will check whether they have been set up as a Glasnost user AND if they have been linked to the project in question. If so it will let them in. The advantage of this is that when they download documents this will be recorded and be available for you to view within the Projects module. So you can restrict access to sensitive documents without having to bother users with a password, and keep track of who has viewed what. Sometimes you need to move documents from one project to another. Previously you would have to have downloaded the document and then uploaded it, or them, to the new project destination. 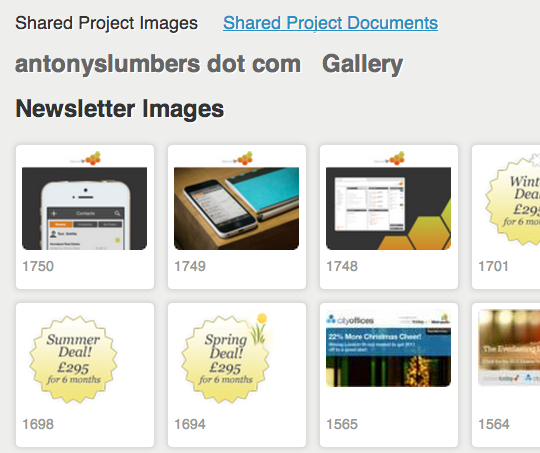 Now you can just go to the edit screen and there you'll find a new dropdown showing all the projects you are linked to. Simply select where you want to move the document to. And there is more. Glasnost21 will automatically move all versions of the document in one go. So you do not need to move them all one by one. 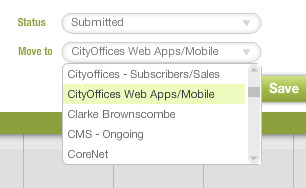 And, if you go to view all documents you can select multiple documents and batch move them as well. We think this will save some of you a lot of time. And might be useful occasionally to everyone. Historically you've been able to add comments about any contact in your Glasnost. What you've not been able to do though is email them directly from within Glasnost. So you would have to go to your email software and send a message from there. If it was something you wished to make note of in Glasnost you would need to copy/paste the message over. But now you can do that from within Glasnost. Now if you submit this form the information will be stored in Glasnost (including a link to the document you attached) but also sent as a neatly formatted email to the contact in question. So your contact receives a nice email, and you have a permanent record, in the place you need it most, of the correspondence. And if your contact replies to the email you will receive this message and it will be automatically added into Glasnost. Hopefully this will help you keep everything you need together whilst still allowing you to contact people by email. People use Glasnost in many ways but for a lot of users the No1 thing they do is add tasks in Contacts to prompt interactions with their clients or prospects. So a typical day involves: 1. Open Contacts 2. Search tasks to bring back those with an end date of 'Today' 3. Work through these tasks 4. At end of the day move those unfinished tasks to tomorrow. Now point 4 can often take quite a while. You might well have twenty or more tasks that you've not managed to complete but need to do asap. i.e tomorrow. So you have to individually edit the end date for each of these tasks. And there you have it. All your unfinished tasks today will be moved to your chosen new end date. We know for some of you this will save you a lot of time. We're delighted to say Version 3 of the Glasnost iPhone App is now available for free download. We think it looks great and these new features are really useful.